During the spring of 2010, a group of women met to discuss the start of a sorority that would engage, educate, and empower women from different economic, social, and racial backgrounds at the University of Texas at Dallas. They were looking to fill the gap in the University for a group of women to grow professionally, academically, and emotionally that would exemplify distinction and thus Sigma Lambda Gamma National Sorority, Inc. was chosen. In August of 2010 this group of women became known as Women of Wisdom, Excellence, and Distinction (W.O.W.E.D.). W.O.W.E.D. encompassed all the qualities that coincided with the aspirations of the individuals and the core principles of Sigma Lambda Gamma. On February 12, 2012, 14 women were inducted into the sisterhood. The following women were inducted: Mayrani Velazquez, Bibiana Enriquez, Rubi Resendiz, Rumsha Hafeez, Ashley Cardenas, Erika Romero, Lizzette Velazquez, Viviana Alers, Erica Santamaria, Andreina Acosta, Liliana Sanchez, Livia Palomo, Helen Reyes, and Janet Franco. The journey had officially begun with the words "Culture is Pride, Pride is Success.". On February 16, 2013, after months of hard work and paperwork the charter was granted and thus the colony became the Lambda Epsilon Chapter of Sigma Lambda Gamma National Sorority, Inc. the 126th chapter chartered nationally. Our founders, #4 Rumsha "Unstoppable" Hafeez Mughal and #7 Lizzette "Tenaz" Velazquez, both graduated this year from institutions of higher education. Dr. Rumsha Hafeez graduated from one of the nation's top medical schools (Texas College of Osteopathic Medicine) and Lizzette obtained her MBA from the University of Texas at North Dallas. Our sisters are dedicated, academically driven women, many of whom are able to attend university due to scholarships awarded for academic excellence. Being a sister of Sigma Lambda Gamma means being dedicated to not only meeting the expectation, but far surpassing it. Our national philanthropies include Breast Cancer Awareness and TRiO Programs, however from our beginning as an interest group we have worked for the betterment of UT Dallas and the surrounding community. Every sister logs a minimum of 20 service hours per semester. The summer of 2017, our sisters #61 Gabriella "Kichea" Castillo (left) and #41 Adriana "Hestia" Portillo (center) executed Starting Off Right (Comenzando Bien) in the Plano community. 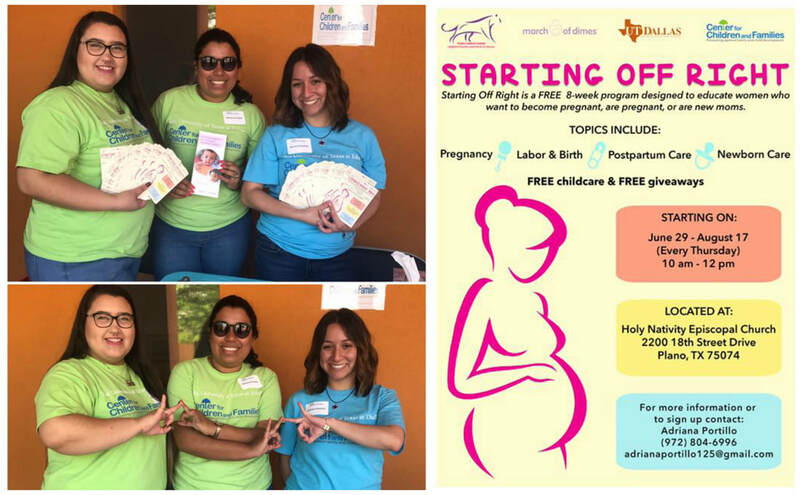 This 8 week program, which won Program of the Year 2017, was offered for free to any young pregnant teens or mothers who wanted to learn more about their pregnancy and newborn child care. At UTD, our sisters do not shy away from demonstrating pride in our cultural roots and showing a respectful and eager interest in learning about the cultural backgrounds of others. Throughout the years we have participated in Hispanic Heritage Month, Safe Zone Programs, Diwali, Black History Month, and more. You have probably heard this term a lot, often times it can be synonymous with 'cultural competency'. Cultural awareness is something our sisterhood, nationally and locally, strives for. It is the cornerstone of a unique and diverse sisterhood like our own, one that has over 110 cultural backgrounds represented within it. We empower our sisters and the community by encouraging and making opportunities for cultural education. We participate in and hold programs that cater to educating the public about certain cultural aspects. 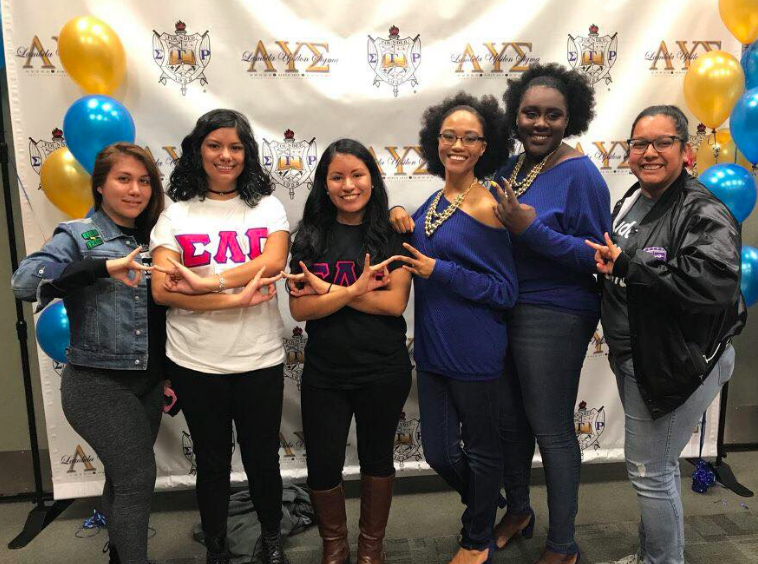 Our newest sisters #70 Samantha "Alyanna" Ascencio (far left), #69 Melodie "Alev" Saucedo (left), #66 Jennifer "Imara" Torres (center), and #71 Alexis "Freyja" Bernal (far right) showing support to the newest members of Sigma Gamma Rho Sorority, Inc.
Sigma Lambda Gamma strives to be the premiere organization committed to providing a mechanism of empowerment to ALL women. On the right is our sister #25 Samantha "Levina" Melendez pictured at the Women's March this year. Morals and Ethics is often what we call "doing what's right, even when no one is watching". Empowering our sisters to be morally and ethically wholesome individuals is something we work towards every day.